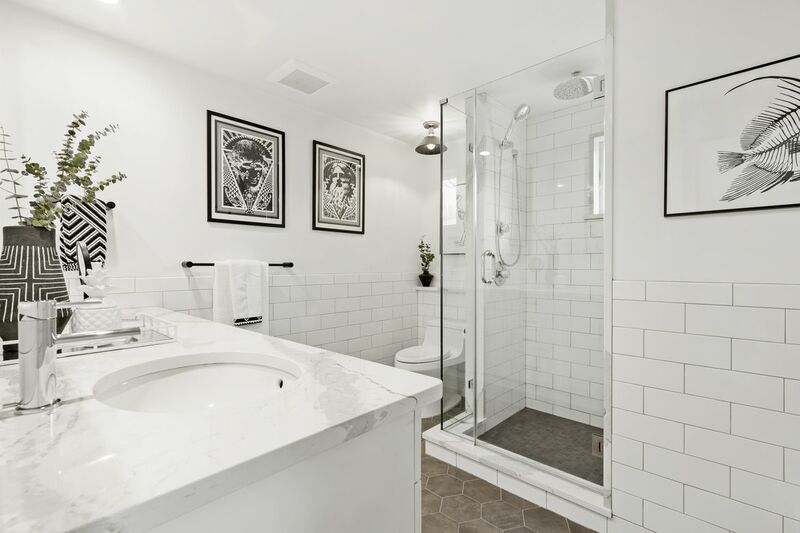 The stark black-and-white palette is carried throughout the house, but the designer turned to materials, accessories and art to keep the master bathroom from feeling too sterile. Rowland says the homeowners spent hours on Houzz saving photos of black-and-white bathrooms and sharing their ideabooks with her for design inspiration. Since the home’s other bathroom includes a tub, the homeowners felt comfortable forgoing one in the master bathroom in favor of a large walk-in shower. The subway tile-clad shower has both an overhead rain shower and a handheld shower head. The homeowners found all of the framed black-and-white artwork online. “The art pieces include lots of geometric shapes and patterns that add interest to the space,” Rowland says. The floors are covered in a charcoal gray ceramic hexagonal tile. “At first we were going to go with rectangle-shaped tiles, but the hexagons really help to break things up,” Rowland says. The vanity area features more of the room’s black-and-white palette. The countertops are a white marble-look quartz with black veining. The two vanity mirrors have thin black metal frames. And the white cabinets include matte black drawer pulls that are hexagonal to complement the floor tiles. 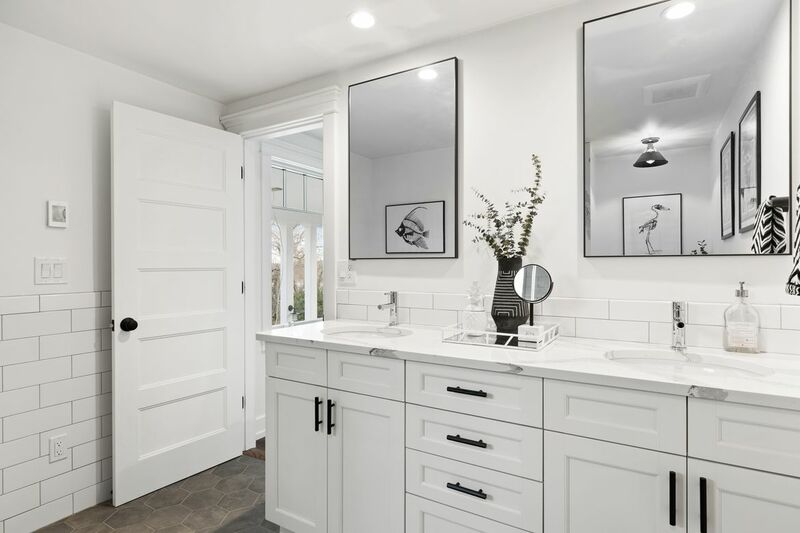 Rowland selected the accessories for the bathroom, including the white-framed tray seen here that holds a vase, makeup mirror and storage container. 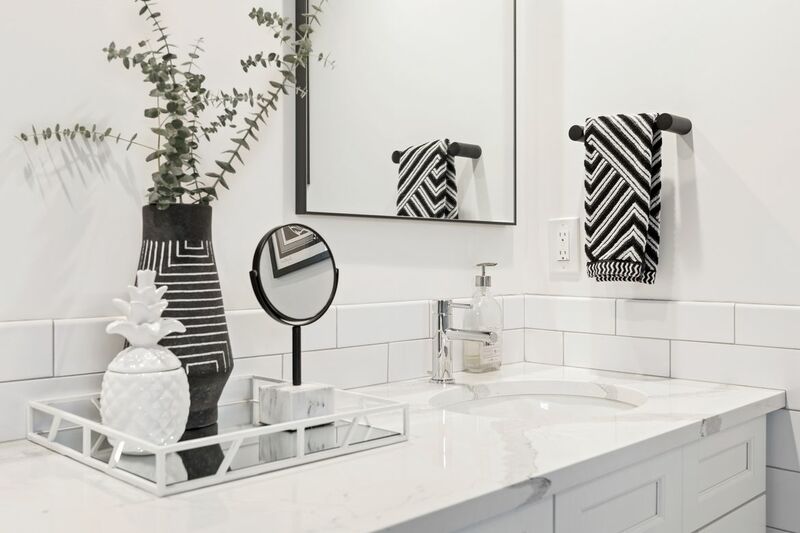 The black-and-white zigzag towels add yet another pattern that adds energy to this sleek, modern space.